When I was little, before I discovered shopping and boys and all the other infinitely important distractions of adult life, one of my favourite things to do was help my Mum out with drinks and dinner parties. Actually, who am I kidding? It’s still one of my favourite things: the selection of ingredients and writing up lists, laying out platters and plating up dishes to make the food look as pretty and enticing as possible. If you’ve ever wondered where to find me at a party, the kitchen is usually the best place to start. Back in the eighties and early nineties, I knew my Mum’s drinks party recipe repertoire like the back of my hand. To look at the incredible food she laid on for our recent engagement party you’d never have guessed it, but Abigail’s Party-esque cheese on a stick stuck in half a grapefruit certainly made several appearances, along with other recipes that have better stood the test of time, one of my favourites being her incredible cheese straws. Salty, crunchy and crumbly with a just-the-right-side-of-greasy aftertaste and a strong hit of cheese, these little nibbles are the ultimate accompaniment to drinks. I’m not talking about those shop bought packets of limp puff pastry twists with a straggly coating of cheese though, for me a cheese straw should be made of an altogether shorter pastry, rich with cheese running right through it and the perfect combination of crumbly and flaky. Our family recipe for cheese straws came from an ancient cookbook entitled Poor Cook, written by Susan Campbell and Caroline Conran and published in 1971. Despite its fading brown cover and complete lack of any photography or illustration (other than a few slightly shady line drawings, again in brown), the recipes are good, solid British grub at its best. The recipe for straws calls for butter, flour, eggs and paprika, possibly a tiny bit of milk, and is everything – in my mind anyway – that a cheese straw should be. This weekend I wanted to make some salty nibbles to accompany the prosecco we were sampling for next year’s wedding (I know, it’s a hard life). As we were heading out for dinner afterwards, they needed to be fairly light, delivering power through flavour rather than weight or volume. I instantly thought of the Poor Cook recipe, but without my Mum’s recipe book to hand, wasn’t sure of the exact ingredients and decided to adapt an Ottolenghi recipe I had instead. I’m on a bit of a crunch kick at the moment with various open packets of nuts and seeds that I’ve sprinkled on loaves before baking or toasted and added into salads. 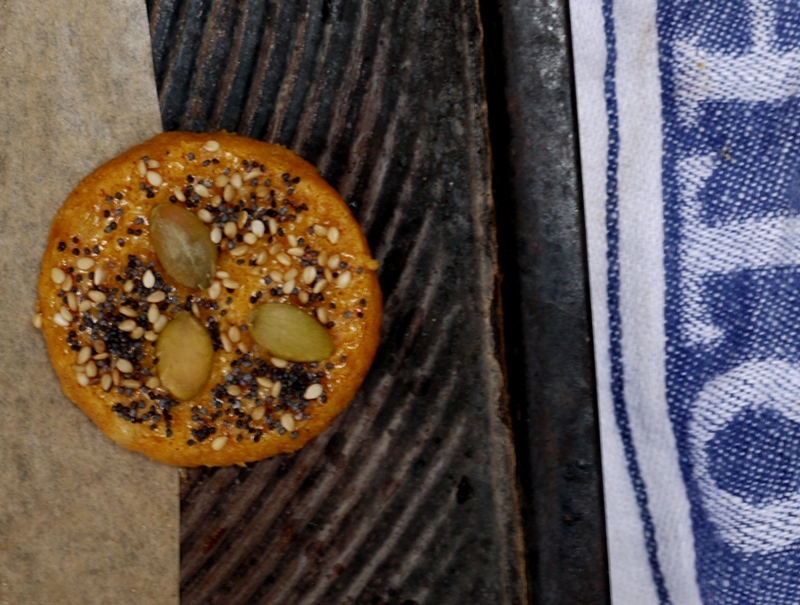 Rather than leaving these biscuits plain or rolling in poppy seeds as Ottolenghi suggested, I studded them with pumpkin seeds, sprinkled over poppy and sesame seeds and upped the spice content to give them a smoky tang and lovely vibrant colour. 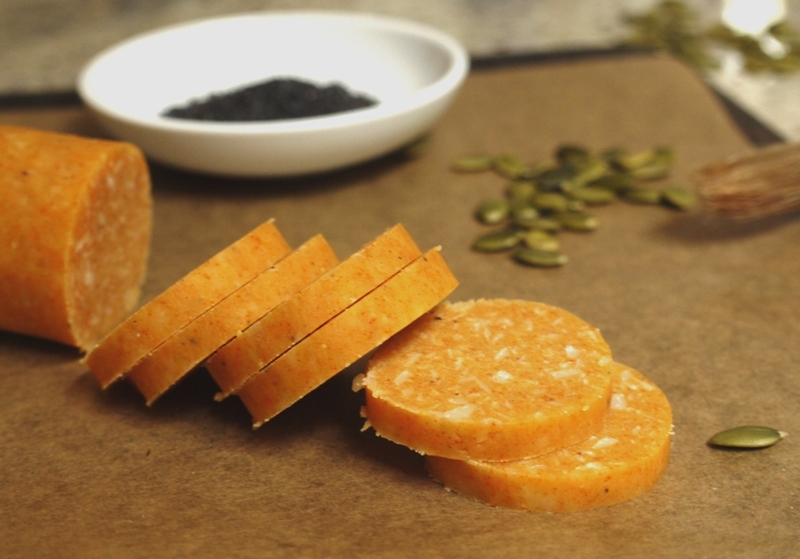 Parmesan replaces my Mum’s cheddar for a saltier, slightly crisper biscuit and the whole thing snaps with satisfying crunch before melting in your mouth and allowing you to return to the all-important task at hand of tasting delicious prosecco. Adapt this recipe as you wish. Swap out the parmesan for another cheese, experiment with different flours, sprinkle with your favourite nuts and seeds or leave them plain for a simple, delicious cheesy hit. Perfect for enjoying with drinks. Cheese and pineapple on a stick, smoked salmon vol-au-vents and stuffed curried eggs entirely optional. Line two large baking trays with parchment paper. Sift the flours, paprika and cayenne pepper into a mixing bowl then add the salt and pepper. In a stand mixer fitted with the paddle attachment (or in a separate bowl with a wooden spoon), beat together the butter and parmesan until well combined. Add the dry ingredients and mix until a soft dough is formed. Put the dough on a floured work surface and divide into two. Roll each piece into a log around 3cm in diameter then wrap each log in cling film and pop in the fridge for firm for an hour. Preheat the oven to 170 degrees C. Remove the logs from the fridge and slice into rounds about 6mm thick then lay on the baking sheets, spaced 3cm apart. 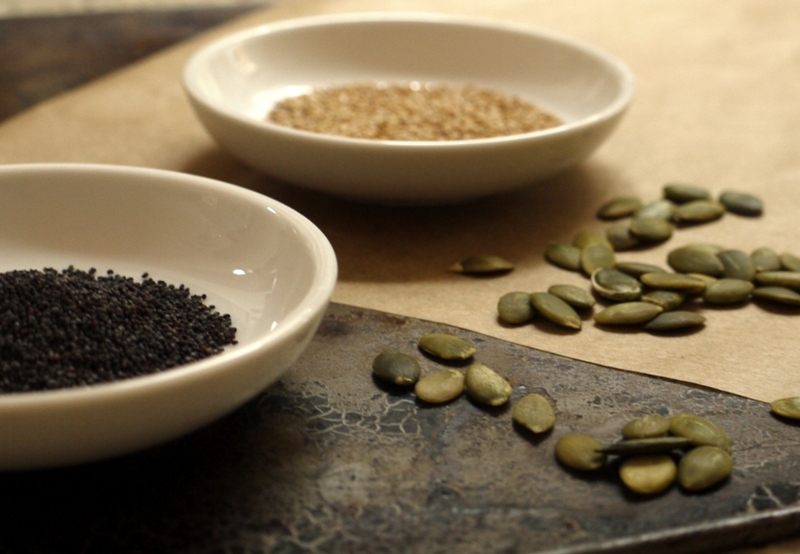 Brush each round with a little egg wash then place on three pumpkin seed and scatter with poppy and sesame seeds. Bake for 12 – 14 minutes until dark golden and delicious cheesy aromas are wafting out of the oven. Leave to cool completely then store in an airtight container until ready to serve. gorgeous! i loved helping my mom with her dinner and cocktail parties as well growing up, and love experimenting with her old recipes today! these biscuits look divine! Golly your biscuits were DEE-LISH-OWSE!!!! These little kind of nibbles are my absolute favourite thing (especially with a glass of prosecco!). I love the crunch that you’ve added to them and the kick from the paprika. I will definitely be making these over christmas! Can´t go wrong with cheese nibbles and prosecco! Your description of your mom´s parties sound like the best thing, totally different from my mom, jaja! I love seeds on everything too! They look lovely! They would be great for entertaining as most the dough could be made in advance and left in the fridge until needed. A great idea for the Christmas season. 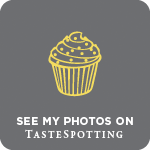 Adrian – glad you enjoyed them! Kathryn – paprika in cheese straws or biscuits is a must for me. 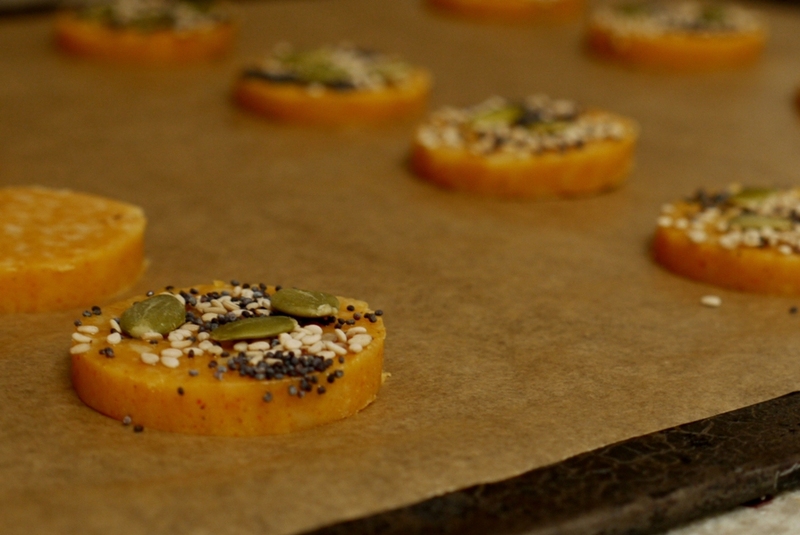 Paula – the seeds do add a lovely crunch, although they’re also delicious without. Stephanie – exactly. I defrosted a log of dough last night and baked some more for a dinner party this evening – easy peasy! Frugal Feeding – prosecco, red wine, they’re a good accompaniment to pretty much anyway. Mmm… I am a Parmesan addict! I love the look of these ones! Those biscuits look absolutely fantastic. They definitely wouldn’t last long in our house as my husband devours anything containing cheese. These little biscuits are just so beautiful. I love how they’re studded and spiced. What a great recipe to have now that the holiday season is upon us! Narf – they certainly didn’t! Daisy – I think you could use other kinds of cheeses, although if they have a slightly higher water content you might like to add a little more flour. Becs – you could bake these as straws too, I just love how the little round biscuits look. Dana – it does, the dough goes an amazing orange colour! 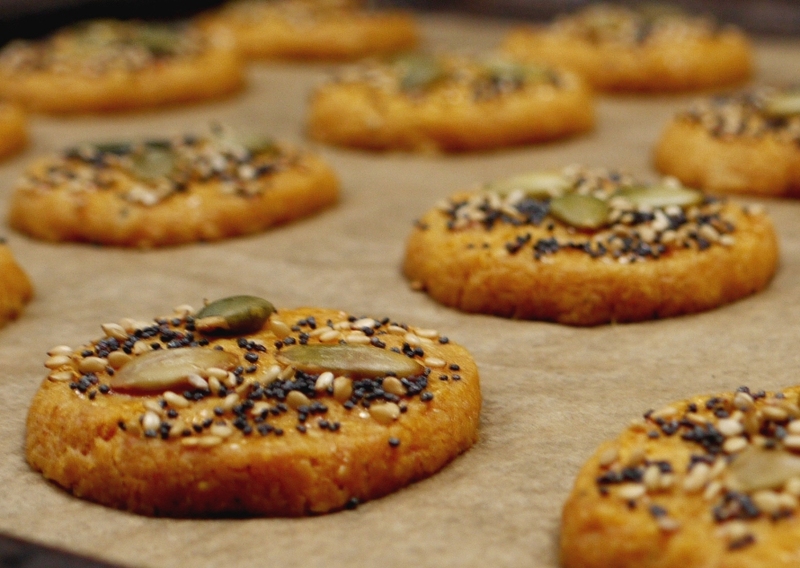 Sacha – I’ll definitely be making them again over Christmas. Once again I find myself catching up on my favorite blogs and reading backwards. Love these biscuits and the beautiful photography. How did the prosecco tasting go? Everytime I try to make these the dough turns out very dry and crumbling – any suggestions?? I’d try adding cold water or milk, a teaspoon at a time. Do let me know how you get on! I think I may have been converting the grams to cups ratio incorrectly, and adding too much flour. Hence the brittleness. Ok, actually the dough was coming out brittle because I was not mixing the flour and butter together long enough. But now another issue: When I put them in the oven they expanded and became too soft!